This Yant design is one of the most Powerful Yantra designs possible. It is also sometimes (rarely) applied as a Sak Yant Tattoo, but only certain people get lucky enough for the Master to agree to lay this image on the devotee. The Master will consider the mental tolerance of the devotee before deciding if it is fitting or safe enough to apply this Deity onto their skin. People involved in professions that are punishing evil will do well to have Pra Narai guiding them and watching over, because Pra Narai helps the Human Race, and also is the Punisher and puts all wrongs back to right. He always comes down to Avatar and to bring Justice whenever Evil walks the Earth. He is a Deity that will bring all qualities of blessings ranging from riches (choke laap) through protection (klaew klaad and kong grapan) up to charm and sales (Maha Sanaeh and Metta Mahaniyom power). The Yant were made in 2550 BE. They have official stamp of the temple and numbered edition code. High quality cloth is used as is always the case with amulets and Wattumongkol from LP Ka Long. Nuea Samrit Chup Tong Pon Sai – Run Payaks Thaksin Wai Kroo 53 Pra Ajarn Amnaj – Samnak Songk Khao Sam Lan, Amper Ta Sae, Chumporn. 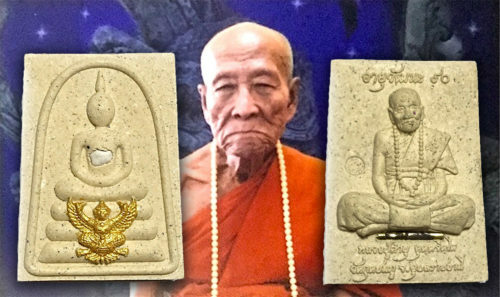 Luang Por Amnaj learned most of his Wicha from the Master Luang Phu Sarm of Lanna lineage in Chiang Mai. This Garuda is full of Amnaj, in addition to the name of the monk who made it being ‘Amnaj’ (power). Both the Nagas and the Garuda offer great power and imposing commanding aura for those in military, air force, navy, special-ops, or civil servant professions. In addition, those who revere Pra Narai should pay reverence to the Garuda, and the Nagas being protectors of Buddhism, should always be seen as a protective influence. The Nagas being Water and garuda being Air, this amulet would be perfect for a Navy Pilot indeed, being empowered with Deities from both elements of the profession. Garuda is for people who wish to be endowed with commanding power, as well as oversight/insight and vision. This amulet is a medium size and thus apt for all sexes and ages to wear.